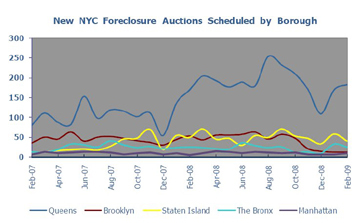 Foreclosure auctions by borough (chart courtesy of Propertyshark.com). Foreclosures in all five boroughs of New York City decreased by 3 percent between January and February of this year, to 269 from 278 new foreclosures, according to the February foreclosure report from Propertyshark.com. Compared to February 2008, foreclosures have dropped 10 percent. Single- and two-family homes saw the highest number of foreclosure auctions, while condos and co-ops saw the lowest. Foreclosure statistics in the boroughs varied widely year-over-year. Brooklyn foreclosures dropped by 77 percent between February 2008 and February 2009, to 12 foreclosures from 53. PropertyShark.com recorded 40 foreclosures in Staten Island this February versus 49 in February 2008, but the borough still had one of the highest rates of foreclosures per household, with one in every 4,125 homes scheduled for auction in February 2009. Queens, where foreclosures increased to 183 last month from 169 in February 2008, has a foreclosure rate of one in every 4,235 homes scheduled for auction. The number of foreclosures remained static year-over year, with 25 new foreclosures this February and last February. Manhattan had four foreclosures in February 2008 compared to nine last month, but the rate remained low, with one in every 81,333 homes scheduled for auction.